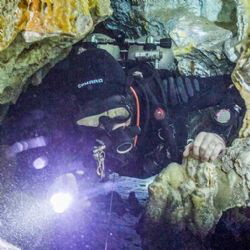 Currently based in Tulum, Mexico I teach underwater photography and shoot mainly cave and cavern diving photography. My work mainly focusses on wide-angle shots of caves, caverns, divers, reef shots and large marine life. My main setup is an Olympus OM-D E-M5, Olympus 8mm Fisheye Pro, Nauticam housing with 4.33" dome and 20mm mini-extension, and dual Sea & Sea YS-D2 strobes.